William Duke of Normandy has invaded England to claim the throne with his Norman army, the only thing that is stopping him is Harold the Saxon King of England and his army that as just fought and won the battle of Stamford Bridge. This game is designed to be played over 2 to 3 hours, there is a 20 bound time limit on the game. Combat is fast and fun and all you require is a pair of normal dice. The rules are extremely simple, but you will never get the same game twice. The map is designed to be constructed either 2 dimensionally or 3 dimensionally, the choice is yours. 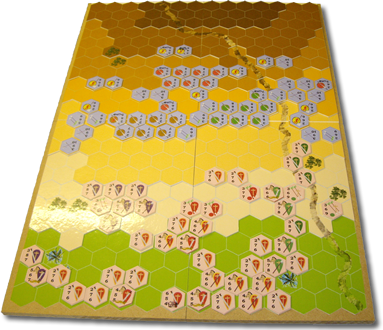 With the 3D board you get a real feel for the battlefield that you are fighting on, you can see the ground you need to capture and the tactical position of all the units. Can you capture the Throne of England or stop the Norman Invaders? Gene Dickens 9 9 9 One of the more interesting Orders of Battle for Hastings. No cookie cutters here. The hexagon playing pieces drive me nuts, but, they are well done as is the map. I haven't read the rules yet. Neal Rosen 10 10 1 While the game itself is excellent, the customer service is terrible. I wrote soon after downloading the game that I had no experience building a 3D board & asked for help. I got none! matt rabold 10 8 9 Good game for the money. Had my Military History students try it and they were generally pleased.